A successful pop musician writing a good novel as John Darnielle of The Mountain Goats has done, is such a rarity I can’t think of another example. 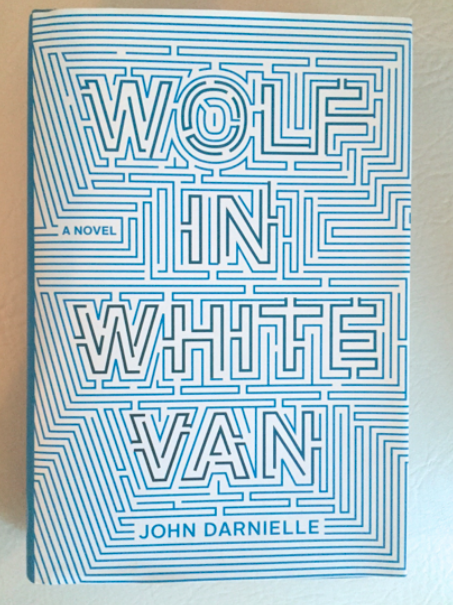 Wolf in White Van is more than a curiosity of interest to Mountain Goats fans, it’s a stand-alone wonderful book, a maze of slippery, non-chronological text about a solitary mail-order fantasy-game designer who suffered a disfiguring accident in late adolescence, and his ability—or not—to move past it. The game, Trace Italian, is like a dark choose-your-own-adventure, whose movements and players make up a part of the narrator’s story. From its opening moves, excerpted at length, it becomes clear that Darnielle is creating something unique, weaving together gamespace with adolescent urges of loneliness, violence and longing, and where we will end up, we do not know. For the third time since sunrise you see men in gas masks sweeping the highway. It’s dusk. They are approaching the overpass where you hide in the weeds. You can only guess, but guesses are better than nothing: you calculate your chances of escaping unnoticed at 15 percent. When the nearest of them is close enough for you to hear the sound of the gravel underneath his yellow rubber boots, you know that the time has come for you to act. Some people, as I’ve seen from reviews, feel that this is a book whose plot points are subject to spoilers, and that the ending is a surprise. I thought that what type of accident narrator Sean suffered and how/why it happened was pretty obvious from the opening pages, so I’m going to discuss it—exit now if you want the unadulterated experience. I have always been interested in this topic, I suppose I remember enough of angry adolescence that the atrocities that occur have never seemed so improbable. The real reveal is in the relationship between the older and wiser present-day narrator and the teenager, and what the Trace Italian—a stand-in for the narrator’s unchecked imagination—ends up meaning. That part, I will not spoil, though I wish I could, because I found it breathtaking and very sad. I wonder if Darnielle will write other books.